Eastern/Central Europe offers significant opportunities to LCCs. The region's faster-growing, lower-wage economies are relatively under-penetrated by the low cost model, and by air travel in general, compared with Western Europe. Furthermore, outside Russia, Turkey and Greece, the region contains very few sizeable legacy airlines and even fewer in strong financial health. Wizz Air and Ryanair, already established as the two leading airlines in Eastern/Central Europe (ex Russia, Turkey and Greece), look well placed to build further here. According to OAG data for the week of 13-Jul-2015, number one ranked Wizz Air is growing seat capacity by 25% year on year, while number two Ryanair's seat numbers in Eastern/Central Europe are up 22% from their level a year ago. Wizz Air's recent aircraft order demonstrates its resolve to stay in pole position. However, breaking the region into its component markets, Ryanair often comes out ahead of Wizz Air in countries where they both compete. Whichever one of Europe's two lowest unit cost airlines can win the fight for cost leadership will likely be the long term winner in Eastern/Central Europe. Wizz Air and Ryanair are respectively the number four and number five ranked airlines by total number of seats in all of Eastern/Central Europe (week of 13-Jul-2015, source: OAG). Both have a similar number of seats in the region and are around 40% bigger than the airline occupying the number six ranking. However, the definition of Eastern/Central Europe used in CAPA/OAG databases differs from that used by Wizz Air and the list contains a number of large airlines with their principal place of operation in Turkey (eg Turkish Airlines, Pegasus), Russia (eg Aeroflot, S7, Transaero), or Greece (eg Aegean Airlines). If we exclude airlines from these three countries (none of which are focus markets for Wizz Air), then Wizz Air and Ryanair are ranked at number one and number two respectively. Moreover, the gap to their nearest competitor, Lufthansa, by seat numbers is closer to 80% and they are the only two airlines that operate widely across the region to/from a number of countries both in the region and elsewhere (rather than just flying from one country in and out of the region). 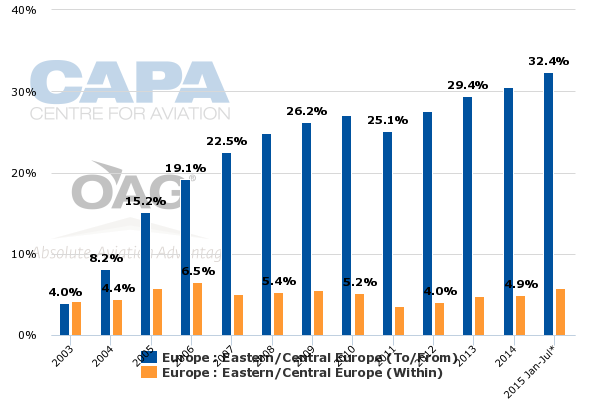 The penetration of low cost carriers in Eastern/Central Europe is lower than in Western Europe (see charts below). This may be partly explained by the low levels of LCC share in Russia, but it also suggests a significant opportunity for LCCs to increase their share in the region. Moreover, excluding those from Turkey, Russia and Greece, most of the larger airlines (in terms of seat numbers) in the region come from outside Eastern/Central Europe. LOT Polish and Ukraine International are the only legacy airlines of any real size based in the "adjusted" region (which excludes the three countries mentioned above and Cyprus). Ukraine International mainly operates on the periphery of the region, with more than 40% of its seats in domestic Ukraine, Israel, Russia, Georgia, or Turkey and much of the balance of its capacity operating between Ukraine and Western Europe. This leaves LOT Polish as the only significant legacy airline that is based in the adjusted region and the only airline of any kind with a meaningful long haul network. Although LOT has recently been through a restructuring programme, with capacity cuts, it now has ambitions to build on its position in the region to expand its long haul network. Ryanair and Wizz Air both have more seats than LOT in Poland and, although these are all deployed on short/medium haul routes, their strength will be a challenge to LOT's need to feed its long haul network from the wider Eastern/Central European region. The relative paucity of large legacy airlines in the adjusted region, which contains a significant number of smaller legacy airlines that struggle to achieve profitability, further highlights the opportunity for LCCs. Wizz Air and Ryanair are, by some distance, the largest LCCs by seats in Eastern/Central Europe, excluding those with main bases in Turkey, Russia or Greece, although easyJet and Norwegian also have an appreciable presence. Wizz Air serves the largest number of airports in the adjusted Eastern/Central Europe, with a total of 36 compared with Ryanair's 27. Wizz Air operates to/from 12 airports in this region on routes that are within the region, compared with 9 such airports for Ryanair. Norwegian Air Shuttle has a total 23 destinations in this region, but these are all served from its bases in Scandinavia, UK and Spain. Germanwings serves 20 destinations in the region from its German bases and EasyJet's 14 airports in the region are all served from elsewhere in Europe (data source: OAG; week of 13-Jul-2015). Wizz Air also flies more routes than any other airline in the adjusted region, with a total of 345, followed by 254 for Ryanair and 137 for easyJet. The nearest legacy airline, Ukraine International, operates 67 routes, while Lufthansa has 54 and LOT Polish has 42 routes to/from/within this region (week of 13-Jul-2015, source: OAG). If, as appears to be the case, there is an opportunity for LCCs to increase their penetration of Eastern/Central Europe, Wizz Air and Ryanair are currently the best placed to capitalise on this opportunity. They both occupy first and second position on a number of measures of scheduled operations to/from/within Eastern/Central Europe excluding Russia, Turkey, Greece and Cyprus. Specifically, Wizz Air is number one and Ryanair number two in this adjusted region for total number of seats, airports and routes. The region generally has lower levels of GDP per head and air propensity for air travel than Western Europe has. These factors offer potential for growth, particularly for airlines that can offer low fares. Ryanair and Wizz Air respectively have the lowest and second lowest unit costs (cost per available seat kilometre) of all European airlines, with only Turkey's Pegasus Airlines coming close to them (but Pegasus operates in a different regional market). The combination of strong market positions and very low unit costs is a winning one. Wizz Air and Ryanair look set to maintain their leadership in the region. The question then will be, will one of the two open up a strong lead over the other? Wizz Air has the larger market share overall in the region currently and clearly sees an opportunity to stay ahead, pursuing growth well into the next decade. This was well illustrated by its recent memorandum of understanding with Airbus over an order for 110 A321neo aircraft, with deliveries to start in 2019, and uncommitted purchase rights over an additional 90 A321neos. Wizz Air's market leadership, by number of seats in the adjusted Central/Eastern Europe region, is largely based on countries where Ryanair's presence is small or non-existent. Perhaps ominously for Wizz Air, Ryanair is bigger than it in six of the nine countries in this region where both are present (see table below). If approved by Wizz Air's shareholders, its A321neo order will give it the capacity to continue double digit rates of growth. Moreover, the lower fuel burn and higher seat density of the new aircraft (239 seats versus 180 on Wizz Air's existing A320 fleet and Ryanair's 189 seats on its Boeing 737-800 fleet, rising to 199 on its newly ordered 737MAX aircraft) should also help it to reduce its unit cost further. Ryanair has unit cost leadership and a significantly larger pan-European network, with five times Wizz Air's overall seat capacity. Wizz Air will need the efficiency benefits of the A321neo and to ensure that it can fill the larger aircraft without unduly compromising frequencies and yields.